In his last fight, Manny Pacquiao was highly suspected for taking Jeff Horn lightly in his training for their WBO welterweight title fight in Brisbane last year. But it's just pure speculation according to his chief sparring partner George Kambosos. Undefeated Australian lightweight fighter Kambosos was recruited to be Pacquiao's sparmate in the preparations for the fight with Horn, which resulted in a disputed unanimous decision. He says the 39-year-old eight division world champion actually over-trained for his title defense against Horn. The 25-year-old Australian is part of two Pacquiao camps, the one against Horn one and the present one against Matthysee. He said Pacquiao trains a lot smarter now. "Justin Fortune is Manny's strength and conditioning coach, and he's my coach as well. He's a really big believer in rest and letting the body recover," he told Sporting News. "We did overtrain for that fight. A lot of people in Australia said they weren't taking it seriously, but the big thing is that we overtrained. He left it in the gym, in sparring and on the road instead of bringing it to the ring." Kambosos says Pacquiao's camp is committed not to make the same mistake again. He promised that the fans will see a very good Manny Pacquiao in this fight, and they have set him up for a very good victory. The Aussie lightweight standout said that if Pacquiao trained for Horn like he did today, he believes his countryman would be stopped by the former pound-for-pound king. "If he did what he did in this camp for the Horn camp, I think he takes Horn out in six or eight rounds, but he's got Matthysse now and that's the full focus." The Sydney-based boxer has sparred several rounds with Pacquiao in the two fight camps mentioned, and was appreciated by the boxing senator that Pacquiao included him in the Kuala Lumpur undercard. Kambosos will fight Filipino JR Magboo and believes his sparring was the best training for Pacquiao. He said his strength in sparring is his speed, head movement and good footwork. Comparing himself to Matthysse, he thinks he is 100 times faster than the WBA champ and a better mover. "When you’re making sparring partners quit, and want to run out of the ring and say ‘nah I’m not getting back in there with that guy,’ you’re definitely 100% ready. 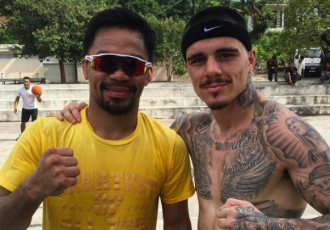 If Manny can land some shots on me - and he does land a few, while I land a few shots on him too and if he sticks to the gameplan his new coach Buboy (Fernandez) and Justin Fortune have set for him, he's gonna hit Matthysse all night long," declares Kambosos. Lucas Matthysse in 44 total fights, has 39 wins, 36 victories by KO, 4 losses and 1 no contest. On November 6, 2010 Matthysse lost a very disputed split decision against former world champion Zab Judah. Two judges scored the fight 114–113 for Judah, while the other judge scored it 114–113 for Matthysse. He suffered another controversial split decision loss to former two-division champion Devon Alexander in a ten-rounder on June 25, 2011. The judges scored the fight 96-93 and 95-94 for Alexander and 96-93 for Matthysse. He then faced unified light welterweight champion Danny García on September 14, 2013 in the undercard to the Floyd Mayweather vs. Saul "Canelo" Alvarez main event. Matthysse was a heavy favorite against Garcia despite being the challenger. Matthysse incurred an injury to his right eye from Garcia's quick right hand, which the champ exploited. Garcia knocked him down in the 11th round, the first trip to the canvas for La Maquina. The judges gave Garcia a unanimous decision with the scores 115-111, 114-112 and 114-112. On October 3, 2015, Matthysse again climbed the ring as the huge favorite to win over the undefeated Ukrainian Viktor Postol. But Postol's four-inch reach advantage took its toll on Matthysse and a counter right hand sent him down. He did not attempt to get up from the floor citing an injury in his eye. Matthysse then went inactive for a year-and-a-half after undergoing eye surgery. The Kawhi Leonard trade grapevine keeps circulating with the Los Angeles Lakers and Clippers usually mentioned as potential teams the All-Star forward might transfer to. The Philadelphia 76ers and Boston Celtics are other probable franchises mentioned who kept interest on hiring the services of the San Antonio Spurs star. Association football, commonly known as football or soccer, is a team sport played between two teams of eleven players using a spherical ball. It is played by 250 million players in over 200 countries and territories, that's why it is considered the world's most popular sport. Other foorltball sports are gridiron football known as American football or Canadian football; Australian rules football; rugby football, either rugby league or rugby union; and Gaelic football. Association football is administered internationally by the Fédération Internationale de Football Association (FIFA) or the International Federation of Association Football, which organizes the World Cup every four years. According to Partha Mazumdar, the term soccer originated in England, first appearing in the 1880s as an Oxford "-er" abbreviation of the word "association." Photo: Manny Pacquiao poses with his sparring partner George Kambosos of Australia.